Stocking a kitchen follows much the same logic as packing for a camping trip. Leave anything that has only one use in the store, and for a handful of invaluable items, spend as much as you can afford and keep them for life. Safety, usability and quality are all factors that are worth insisting upon. As any chef will confirm, though, the list of what is absolutely necessary in a home kitchen runs surprisingly short. Safety trumps style in the kitchen environment, so look for equipment that anticipates danger, then offers a solution. A textured, non-slip material such as silicone, for example, makes the handles of peelers, whisks and knives easier to grip with wet hands. Length, too, is a factor. To avoid unnecessary burns from spitting oil, choose tongs that are at least 12 inches long, with a lock to stop the arms from springing open. 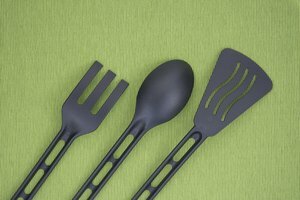 Buy spatulas that are long, pliable and heat-resistant. A knife's blade should ideally run the whole length of the handle for maximum sturdiness. Because working with electric appliances around water can be hazardous, look for cordless equipment wherever possible and, in the case of the handheld immersion blender, one that has a detachable shaft for cleaning. Devote as much of the budget as possible to sourcing the best available knives and pots. 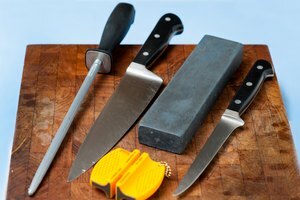 A standard chef’s knife covers 90 percent of cutting tasks, and you need only a paring, boning and serrated knife to round out the set, with a honing steel for sharpening. When shopping for pots, a quality skillet and cast iron Dutch oven are so valuable they are often handed down through generations. 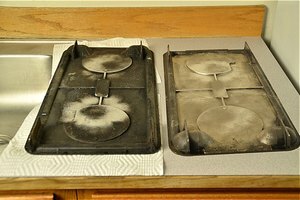 Remember that both skillets and Dutch ovens need seasoning first for a non-stick surface that improves with age. If going for a steel set of pots, on the other hand, make sure there is an aluminum disc on the base to distribute heat evenly. Above all, look for versatile equipment that makes life easier or safer, rather than unnecessary utensils that make the cook appear more sophisticated. Avoid anything with a highly specific task. A banana slicer, for example, makes the "Los Angeles Times" list of the worst kitchen gadgets. The Kitchn says to skip buying a garlic peeler and just smack the clove with a heavy chef’s knife. Take as much inspiration as possible from commercial kitchens. A simple set of steel mixing bowls, for example, won’t warp or stain and covers several tasks. Certain pieces of equipment might appall traditionalists but have proved so dependable that they often find their way into commercial kitchens. Top of the list would be the immersion hand blender, invaluable at mixing anything from mayonnaise to Margaritas. Few chefs have a quibble with food processors, mixers or mandolins, either, but make sure that the time saved in prep isn’t reclaimed by parts that are awkward to clean later on. Other items have a functional appeal. Electric can openers, bottle openers and spice grinders, for example, liberate cooks who might not otherwise be able to wrestle with a heavy pestle and mortar or hard-to-grip handle.